Geomagnetic storms aren't just beautiful to look at — these disturbances in the Earth's magnetic field could also be messing with your mind and body. There's a ton of evidence suggesting that geomagnetic storms can cause everything from depression to cardiac problems — and may even be influencing the stock market. A new paper suggests there's a lot more evidence for this connection than anybody realizes. We talked to the paper's author, and here's what he told us. Top image: Francis Anderson on Flickr. The paper, published in the Proceedings of the Royal Society B, argues that there's a large, disparate, and controversial body of scientific literature that links geomagnetic storms to a number of animal behaviors, including cardiovascular, psychiatric and behavioral changes in humans. And author Dr. James Close has the enormous literature review to back up his claims. 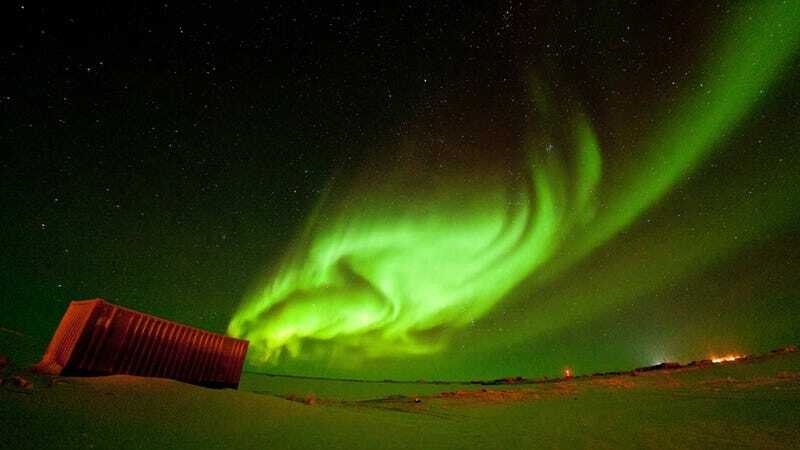 Close, a researcher with Isis Green, tells io9 that he stumbled into the topic of geomagnetic storms and human behavior, when he read a paper published by the Atlanta Federal Reserve (PDF) entitled "Playing the Field: Geomagnetic Storms and the Stock Market." Was this paper just a spurious, one-off finding, or was there a backdrop of corroborating evidence concerning behavioural changes in association with geomagnetic storms? The whole notion of geomagnetic storms influencing human behaviour seems so "wacky" that a very strong body of evidence is required before taking it seriously. And then he started looking into the evidence, and "the whole thing kind of ran away with itself," says Close, who has a PhD from Oxford and a background hematology and psychiatry. Soon enough, he found way more supporting evidence than he ever expected — much of it in Russian, and thus relatively unknown to English-speaking researchers. The argument for a connection between geomagnetic storms (GMS) and behavior ties in with an evolutionary leftover humans that may have — the ability to detect magnetic fields through cryptochromes. There's research tying geomagnetic activity to human health. Amongst those who agree that GMS alter human physiology, one of the explanations is that the geomagnetic field acts as a temporal synchroniser for our circadian rhythms, or influences melatonin production, which the storms then interfere with. Close instead argues that the vestigial human cryptochrome compass system alters stress response in the hypothalamic–pituitary–adrenal (HPA) axis, which regulates much of the body's activities. Most of the research on this topic, as we mentioned, has been published in Russian. And the belief that solar storms influence human activity was a calling card of heliobiology, which was in turn part of the Russian cosmism movement which deified space and science, and was something of a predecessor to transhumanism. It appears that these theories are relatively well accepted in Russia, which puts it on the list of odd medical discrepancies between nations, like Germany's obsession with low blood pressure . I do not know Russian, and was relying solely on those papers which have translated abstracts. Thus, you have to take the headline findings at face value and cannot be as confident about the merit of the work. However, there have been a some English-language reviews of the Russian literature. Also, the Halberg chronobiology group in Minnesota have links with the Russian research and have discussed the Russian literature in their papers. Furthermore, many of the earlier Russian findings have since been corroborated in the Western literature, offering further credence to the research. While the whole concept may seem more than a little bizarre, there's a large enough body of work on the effects of GMS on various animals that it begs to be looked into more thoroughly. So if you've been feeling particularly out of sorts recently, just blame the recent solar flares. Images via NASA/Goddard and Space Ritual on Flickr.